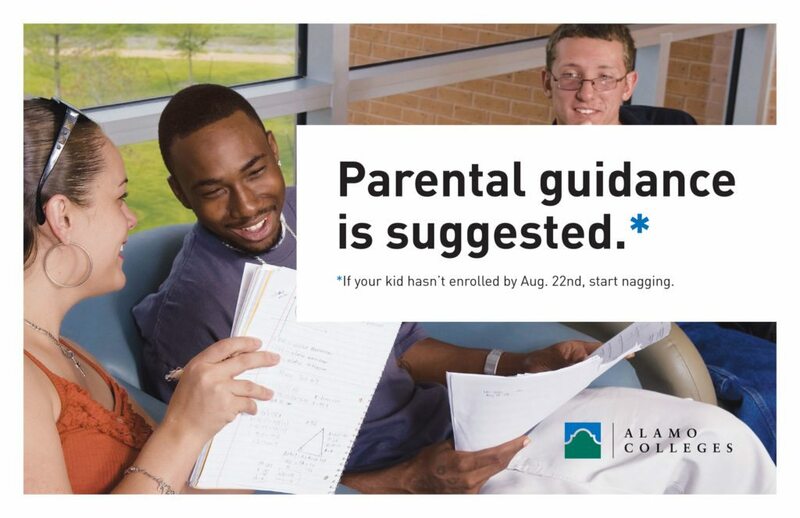 When Alamo Colleges first came to AMG, we conducted independent research to better understand student perceptions of the colleges. Through this research, we found that students were almost totally unaware of the relationship between the district and its five colleges. There was no branding to unify the district as a whole. In fact, each college had its own logo, and the lack of commonality between logos caused further confusion. Also, the word ‘Community’ contributed to a perception that the colleges were ‘small’ and a ‘last resort’ for attendees. 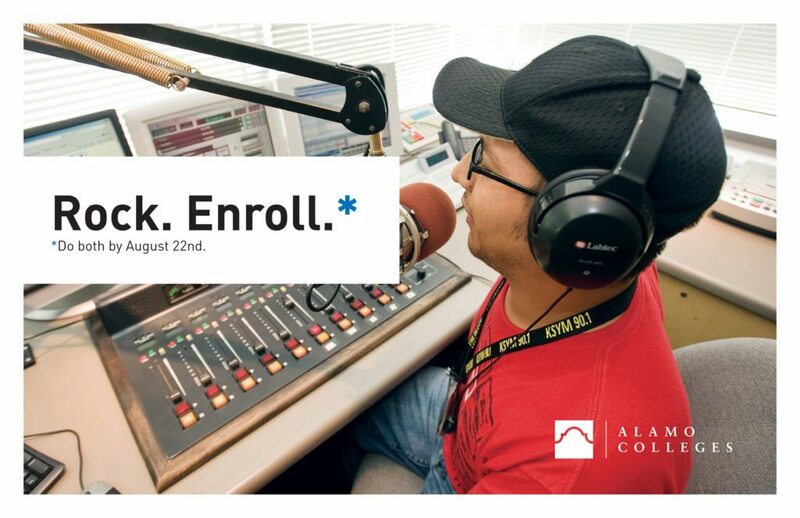 Create an entirely new identity for the district and its colleges. We designed a master logo that featured a modern version of the roofline of the historic Alamo. This template became a unifying element for the district and each of its five colleges. However, we incorporated distinctive colors (taken from each college’s previous logo) to assure individual brand recognition for each school. Our goal for this rebranding initiative was to shift public perception of the institutions. Their new voice of would be edgy and slightly sophisticated—just enough so that it would be engaging to a younger audience, yet still be able to speak to parents who are influential in decisions involving higher education. 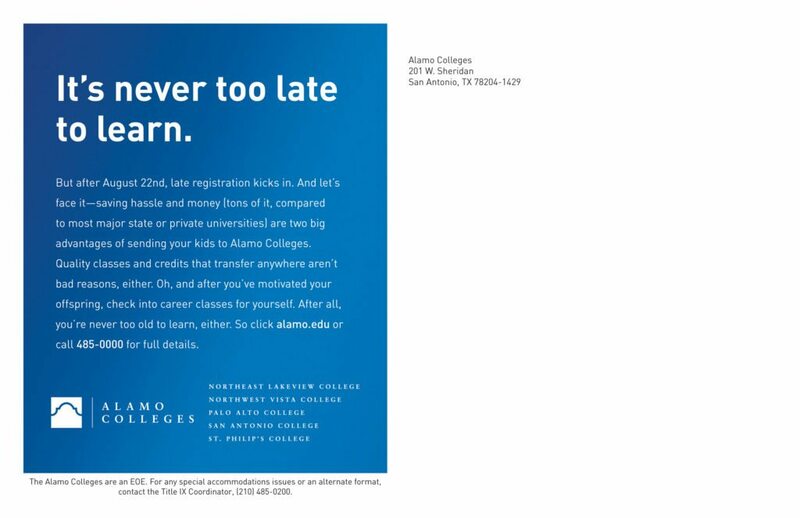 In 2008, when the original studies were completed, there was an average 22.6% awareness of the individual colleges in the Alamo College district. In 2012, when the secondary awareness studies were performed, 75% of respondents were aware of the Alamo Colleges district and its colleges. 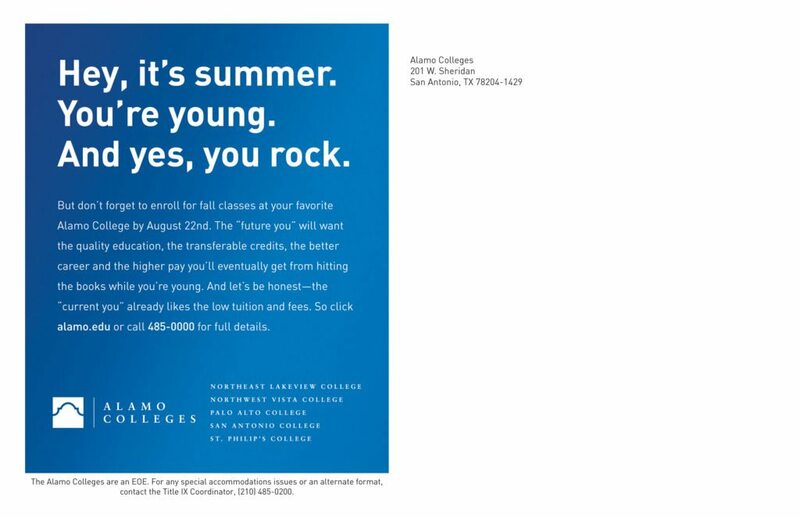 Furthermore, when prospects were asked if they were interested in a specific school in Texas, the number of prospects citing one of the Alamo Colleges increased.